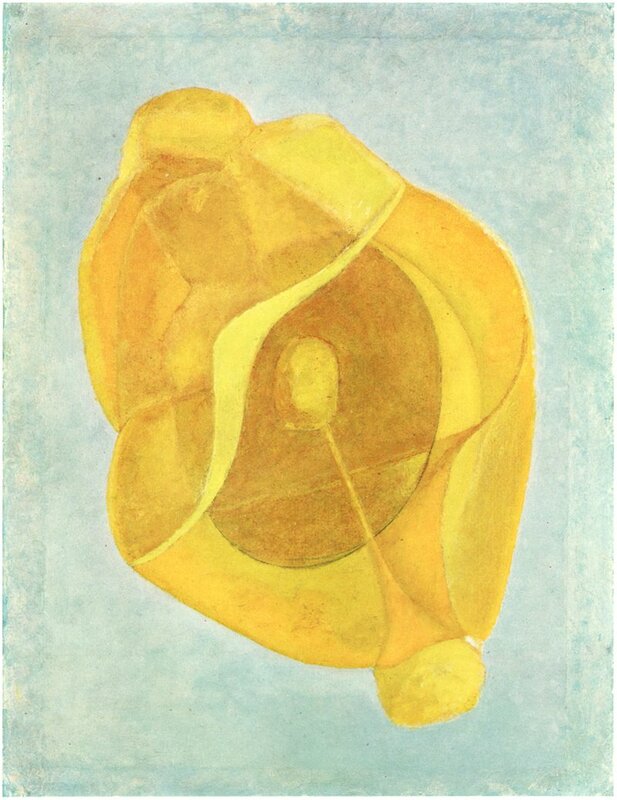 Three paintings by Naum Gabo from his 1959 lectures, Of Divers Arts. “All colors, even in their seemingly identical hues, have a different identity in our vision of them. One and the same color acts differently on different surfaces. Colors change with the change of their place in space or on a surface, and their identity also varies with the time at which they appear in the field of our vision. They change not only according to the neighboring color—a fact by now known to every schoolboy—but in relation to the frame of our vision and its axis, i.e., to right or left of the axis, and up or down from it” (p96). Red Kinetic Painting, 1943 (p97). This painting is meant to be viewed from all four sides, rotating counter-clockwise. Click for larger version. “Color affects the bounds of the shape in which it is enclosed and changes the form of surrounding space; it modulates distances, retards or accelerates the rhythm of our visual perception… Color is the flesh of our visual perception of the world, not its skin” (p98). Yellow Painting, “Strontium”, 1945 (p95). This painting is meant to be viewed from all sides, rotating counter-clockwise. Click for larger version. “Space in our vision is not the distance between far and near, not the above and below, not even the place which is there or here; it is penetrating, everywhere present in our conscious experience of vision… It is ever within our reach, and thus it carries an experience of palpability equal to any conveyed by the tactile sense… Space is not a part of the universal space surrounding the object; it is a material by itself, a structural part of the object—so much so that it has the faculty of conveying a volume as does any other rigid material” (p100). And time “in the artist’s experience is not that static sequence of intervals measured by days and hours of past and future, it is not the mechanical phenomenon we measure by our clocks; neither it is that idea of contemporary science where it has become a relative term dissolved entirely in the idea of space-time so that both become one. Time to us is the faculty of experiencing the continuity of the present” (p100-101). “My explanation of the function of [color and] space and time in the visual experiences of the artist may perhaps be clearer to you in the work to be seen in the following illustration…” (p102). 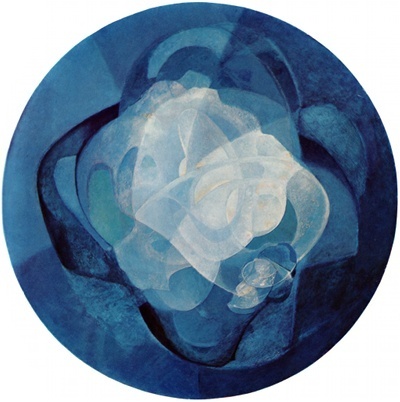 Blue Kinetic Painting, 1945-54 (p103). This painting is meant to be viewed in rotation. The panel is mounted on a motor making one revolution in two minutes. Click for an animation of this revolution. A diagram by J. W. Nicholas, from an appendix of his 1977 Psience (see previous post). 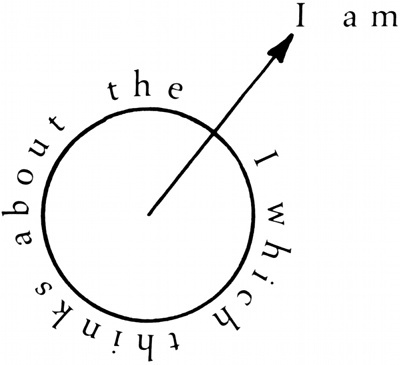 “Cogito means ‘I think,’ but I interpret Descartes’s famous dictum as a contraction of, ‘I think about the I which thinks, therefore I am.’ Thinking requires an object. To think at all, one must think about something. The mystal no-mind is not achieved by suspending mental process but by eliminating mental content. The cogitating Descartes thought about thinking in a way that proved his existence as a thinker. I believe he thought about the I which thinks. “Philosophers know the syllogistic conjunction ergo/therefore requires two premises to balance a conclusion, but Descarte presented only one premise—‘I think.’ His statement either fails as logic or transcends logic. I believe it transcends. 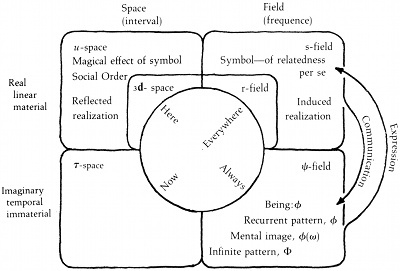 Two diagrams from J. W. Nicholas’ 1977 Psience: A General Theory of Existence. Self-realization of the universe (p59)*. Click for larger version. “Psience posits four frames of reference [as shown in the figure above], two real and two imaginary. (If it were not for mathematical convention, these might be called the material and immaterial.) One real and one imaginary frame of reference are linear; I call them spaces; their dimensions are of interval. The other two frames are non-linear; I call them fields; their dimensions are of regular recurrence, here called frequence” (p13). 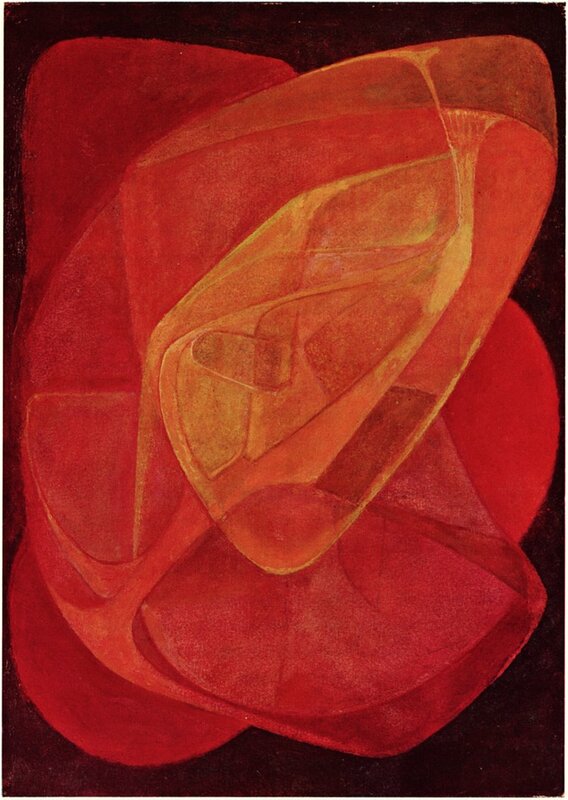 “The real and imaginary frames are formally orthogonal… Thought, spirit, the immaterial or massless in general exist as recurrent pattern in the imaginary field. The imaginary pattern induces its realization in the real field, which is reflected in turn in the real space. Symbols existing in the real field have a magical power to affect the phenomenal world, or real space, in a manner that recalls the power the three-dimensional beings to produce miracles in Flatland. The geometric inversion of linearity is held to be a closed loop, that is, a regular recurrence; induction between imaginary and real fields takes places between closed loops, as with electric current and magnetic flux. 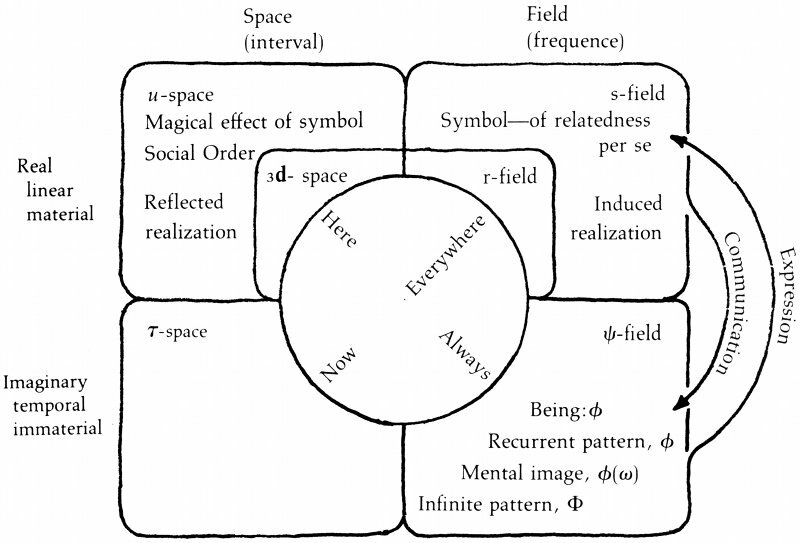 The real field (and perhaps also the real space) has more than three dimensions; the imaginary field and space have unlimited dimensions.” (p15). “As the unlimited dimensionality of temporal interval is disclosed by the statistical independence of different relative likelihoods, so the unlimited dimensionality of temporal frequence is disclosed by the harmonies of recurrent pattern. Though the pattern is imaginary, it may still be useful. For example, we could define the structure of a chord in such a schema without reference to the key in which the chord were played… what Globus (1976) called ‘relatedness per se’. Such a pattern is perpetual rather than eternal, qualitative rather than quantitative, imaginary rather than material. It is defined by its own harmonies” (p27). 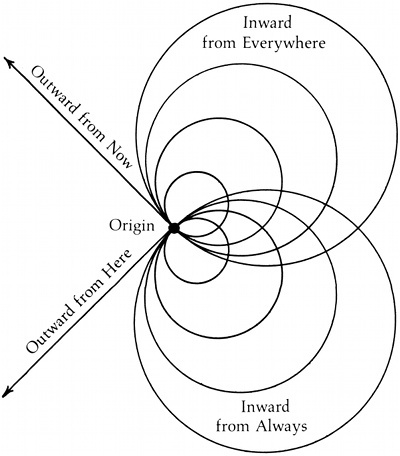 Outward and inward departures from Origin (p39). “…As the point of access to 3d space, τ space, r field, or ψ field, Origin displays four respective facets: Here/Now/Everywhere/Always. [The figure above] depicts outward departures from Here and Now, inward departures from Everywhere and Always. Unlike Here and Now, which serve as zero points for quantification, Always and Everywhere confound and nullify all measurements. Qualitative rather than quantitative, the ψ and r fields disallow direct measurements but still provide a frame of reference in which to consider relatedness per se” (p38). “Psience proposes an inductive coupling between the orthogonal ψ and s fields—between the domain of imaginary, immaterial pattern and the domain of its symbolic representation. What is symbolically represented is relatedness per se. We can label the two arcs of this interactive feedback loop ‘expression’ and ‘communication’ [as figured above] (p58)”. Hence “creation is the self-realization in the real field of relatedness per se in the imaginary field” (p62). * I believe the top figure mislabels linear to the left of u-space, implying that both u-space and s-field are linear, whereas it is u-space and τ-space that are linear (as dimensions of interval). Perhaps a correct label would be spatial, as opposed to temporal, though this blurs the denomination of dimensions of interval as -spaces.